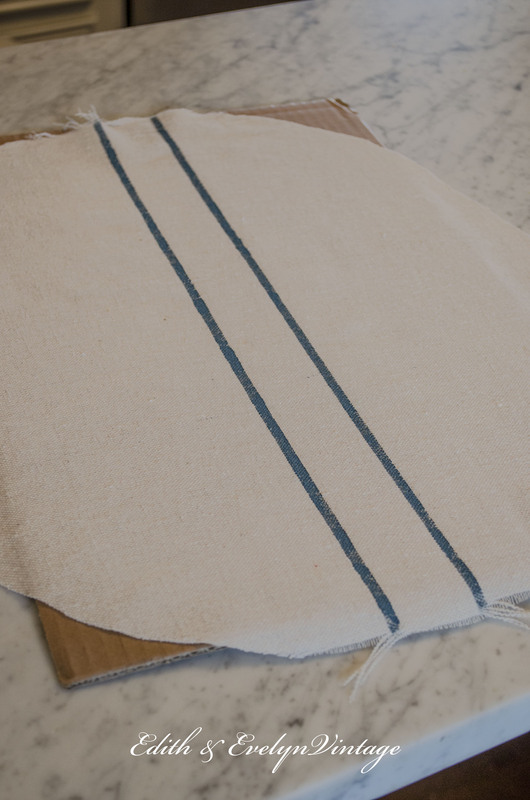 Create Your Own Grain Sack with a Drop Cloth! I get lots of questions about vintage grain sacks, about where to find them, and why they are so expensive. 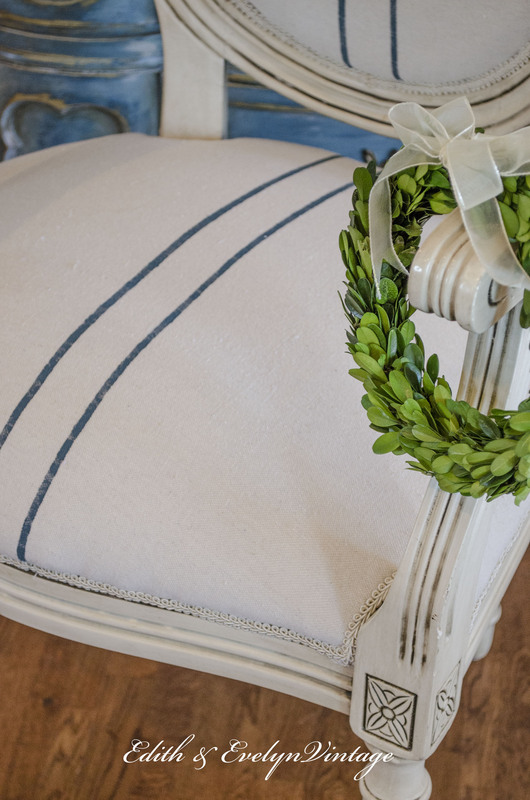 Many of you love the french look of grain sacks in your home decor, but in some areas, they are difficult to find and can be a little pricey, even when you do find them. So I thought I would show you how to create your own grain sack with drop cloths and paint, to “get the look” of the real deal. I have to say, I am loving the finished result, and it was so quick and easy to do! 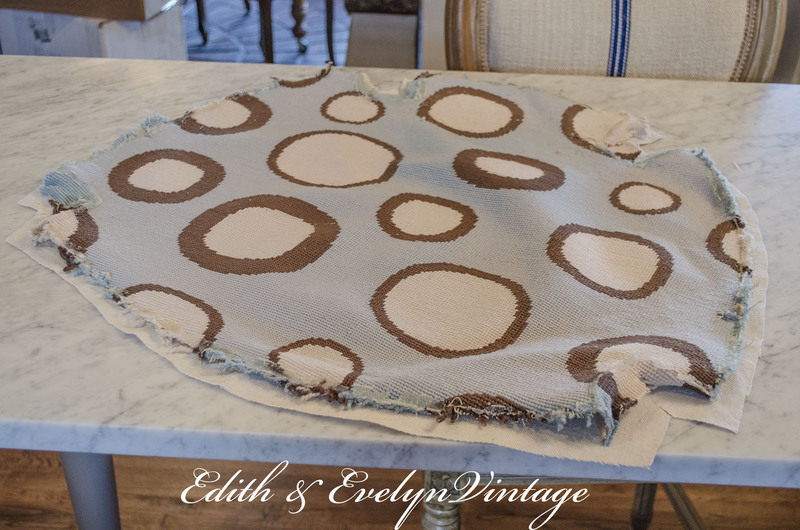 Drop cloths have been used for so many projects, from upholstery to curtains, and I have used them for a lot of different decor ideas in my own home. When washed, they have a wonderful vintage like texture. I Prefer 100% Cotton Drop Cloths! Drop cloths can be found at any home improvement store and even at Walmart. The ones I prefer are made of 100% cotton and can be found HERE. The first thing I always do when working with drop cloths is to wash them to remove any chemicals, and also to add some softness. The cloths that are 100% cotton, and not a blend, are perfect for this project. I always add a little bit of bleach to to the wash to whiten the drop cloth a little bit more, however that is strictly personal preference. If I”m wanting the drop cloth to be really white, I will let it soak in the bleach water for 3-4 hours. After drying, iron the drop cloth to get out any wrinkles and make it completely smooth. 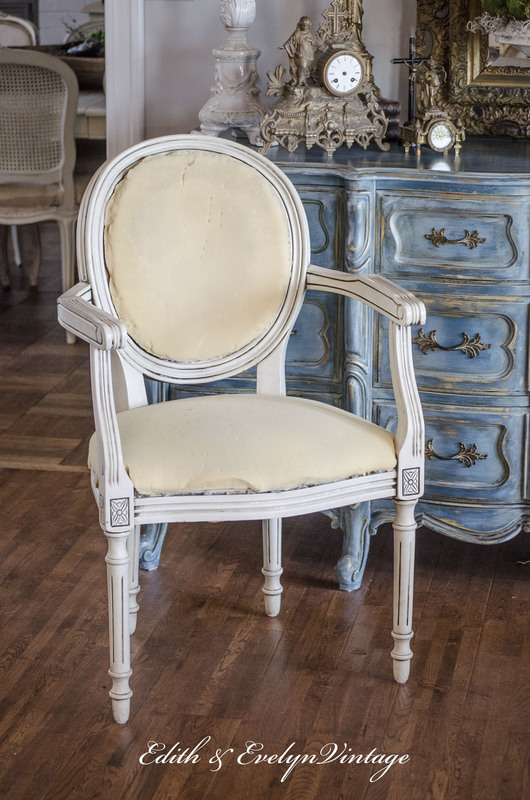 Use a Chair that Fits Your Decor Style! 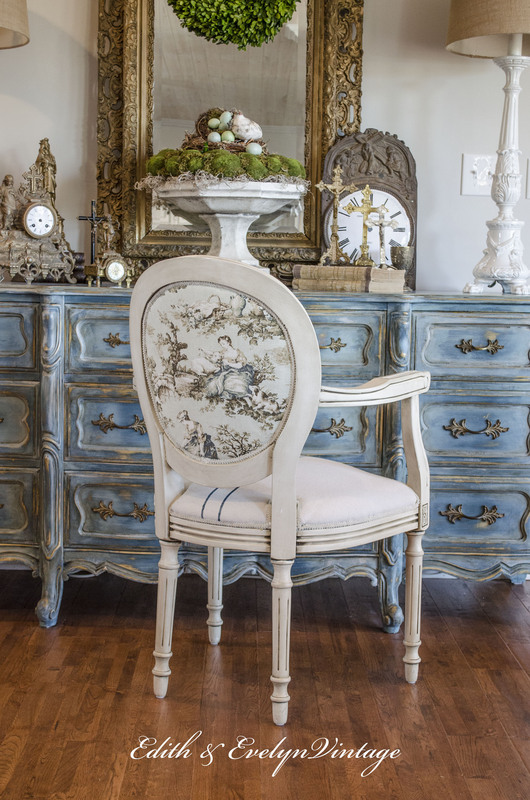 A French style chair that I bought about 10 years ago was the perfect piece to use on this project. The chair isn’t old, so it’s in great shape, but it has very modern upholstery that doesn’t work in my current decor. Hubby was kind enough to strip the old fabric on the chair for me, which was great, since that is my least favorite part of any upholstery project. He was so fast in stripping it though, that I didn’t get a before picture, but here is what the chair looked like after she was stripped. 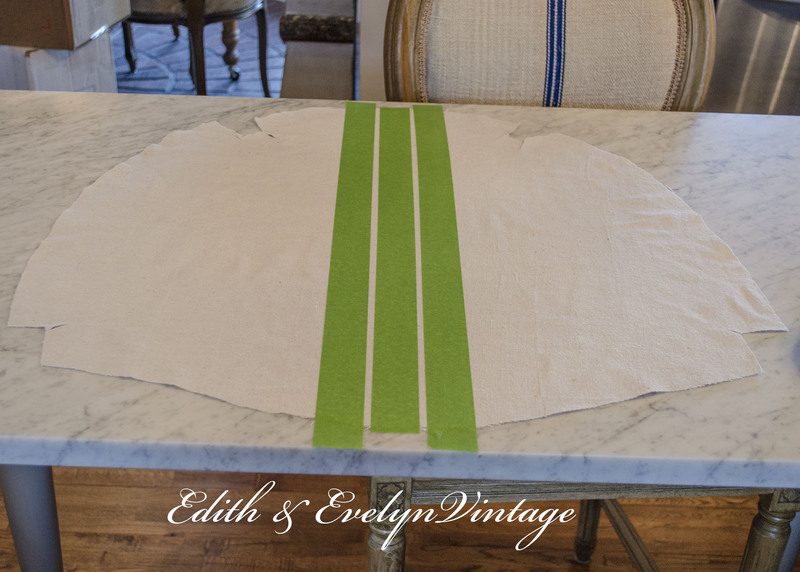 Using the old upholstery as a pattern, I cut out my new pieces from the washed and ironed drop cloth. 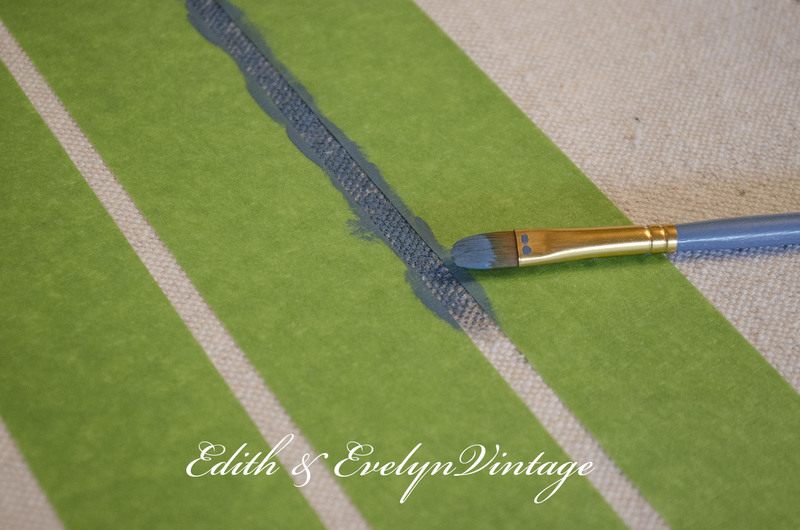 Get Creative with Size of Stripes or Paint Color! Using painter’s tape, I placed one strip of tape down the middle and then spaced one strip on each side to create the stripe area. You could play around with this, creating different size stripes if you wish. Be sure and press firmly along the edges of the tape, so that when you paint, it doesn’t bleed. 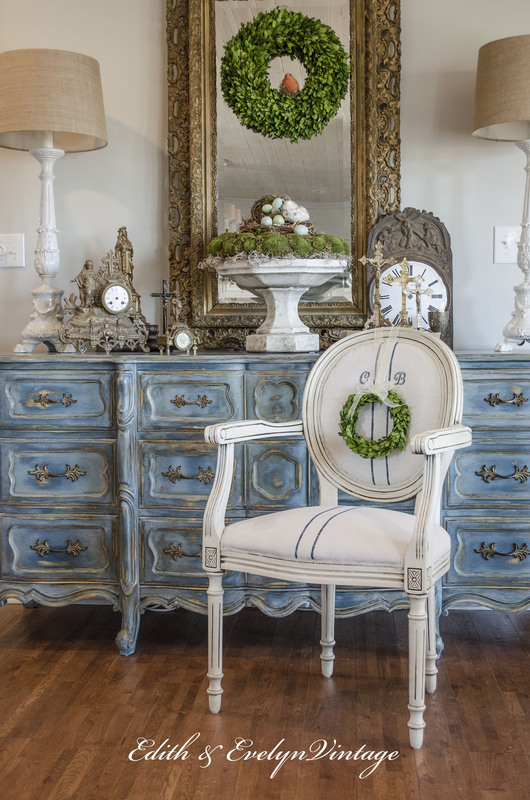 The paint I chose to use was Annie Sloan Aubusson Blue chalk paint, simply because that is what I had on hand, and I love this shade of blue. However, you could very easily use any acrylic craft paint or fabric paint, choosing any color of the rainbow, whatever works with your color scheme. 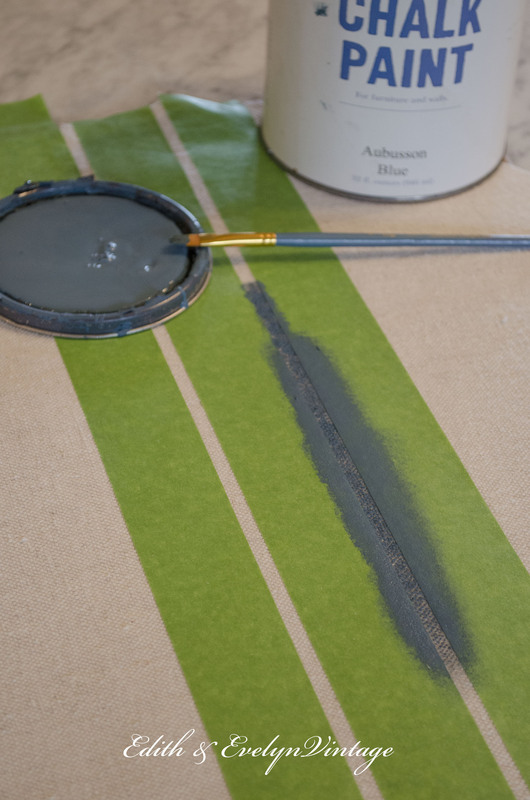 Using a small, flat artist’s paint brush, I painted down each stripe, dabbing the paint into the drop cloth. I didn’t make a solid paint line, leaving it faded in areas so that it would closely resemble what an old grain sack looks like. Be sure and place a piece of cardboard underneath so that the paint doesn’t bleed through to the work space. After letting the paint dry, usually just a few minutes, carefully peel back the strips of tape, revealing the painted stripes! I did this on both pieces that would be used for the seat and back of the chair. Add Details Such as a Monogram, Fleur de Lis, or Crown! Some of my favorite grain sacks are the ones that are monogrammed with the farming family’s initials. They are rare and very collectible. 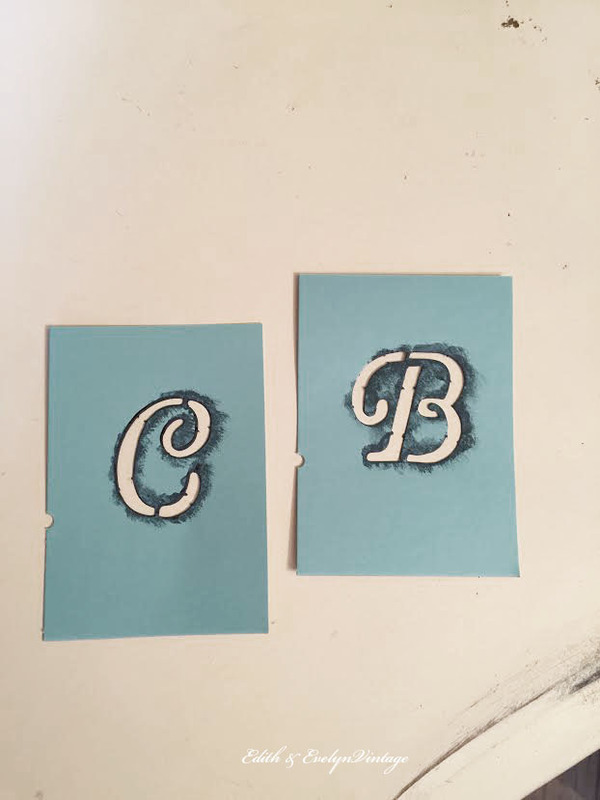 To create the same look, I pulled out some inexpensive alphabet stencils which are easily found at the big box craft stores. Or if you are artistic, you could freehand the letters. Your could also stencil a fleur de lis, or a crown instead of the monogram for added detail. 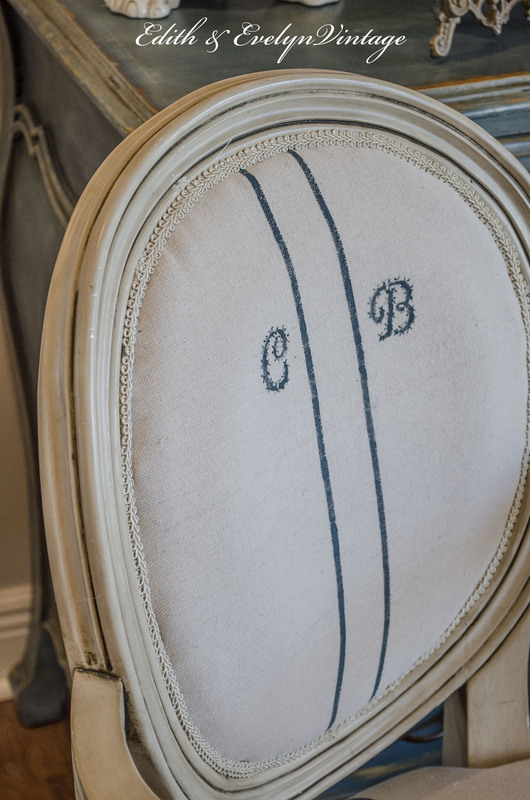 On the piece of drop cloth that would be used for the back of the chair, I placed my initials on each side of the stripe. Using the same paint as I used for the stripes, I stenciled my initials, and taking a small, pointed artist’s brush made some “x” marks on the letters to resemble stitches. Staple It or Glue It! Taking the pieces and centering them on the chair, I stapled them onto the chair frame, and finished with a neutral trim. 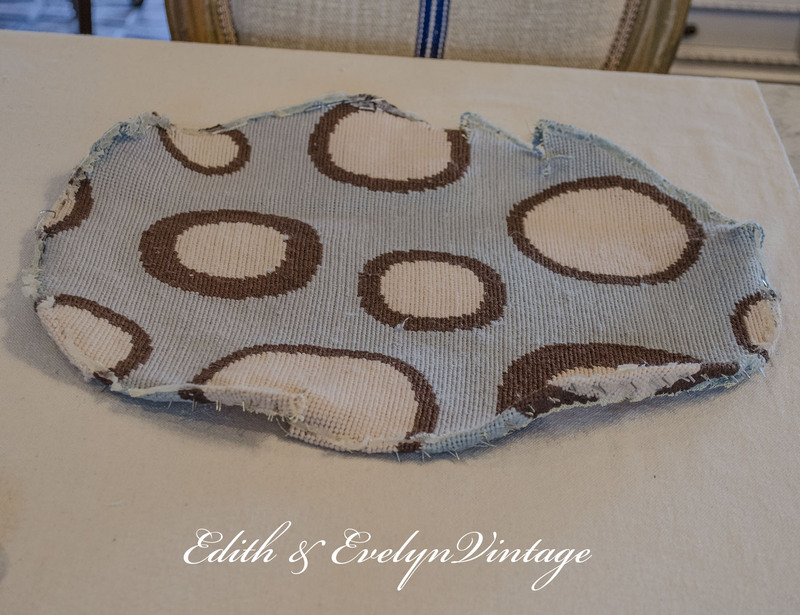 If you don’t have an upholstery or staple gun, you can also attach the fabric using a hot glue gun! Yes, it can be done and it works fine! 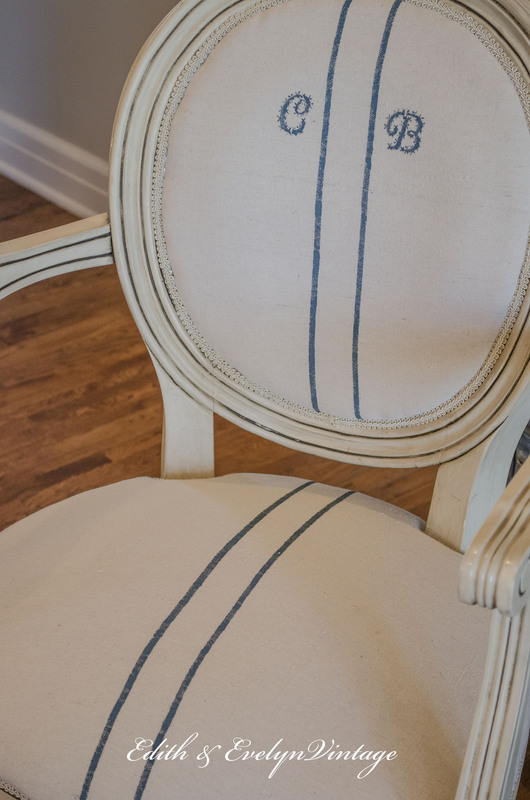 See our french settee upholstered with a glue gun HERE! The end result looks just like a vintage grain sack! It took very little time and minimal cost! Though I have a stash of vintage grain sacks, this turned out so fabulous that I will use these faux grain sacks on the mate to this chair as well. Get the French Look Without the Expense! 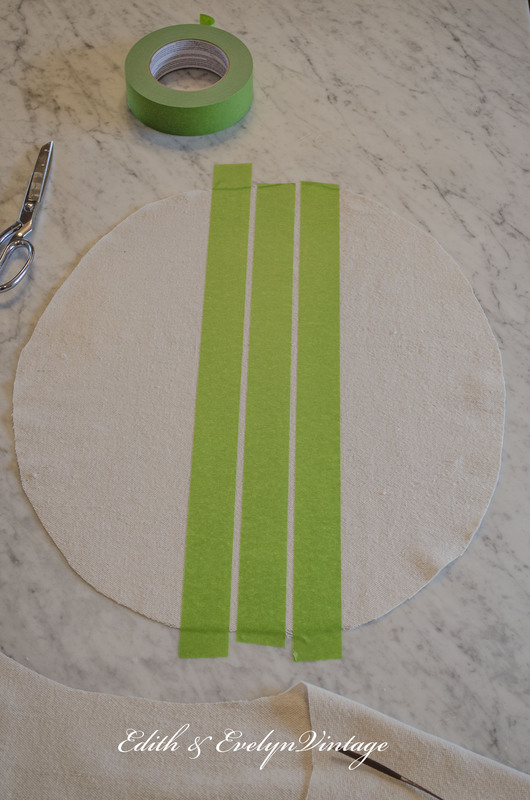 You could use this same technique and materials for so many different projects such as pillows or table runners. And personalize it any way you like, with a monogram or date. It gives you the French grain sack look without the expense! I have to show you the back of the chair, it has a sweet little surprise. I found this beautiful toile fabric at Hobby Lobby about a year ago, and loved the colors, but most of all, I loved the sheep in the pattern! I hope this gives you some inspiration to create your own “grain sack” using drop cloths and paint! How clever, and this chair turned out adorable. Cindy, great tutorial. I’m going to do this for a runner placemats. Cindy, that’s a wonderful idea! Happy Easter to you and yours! 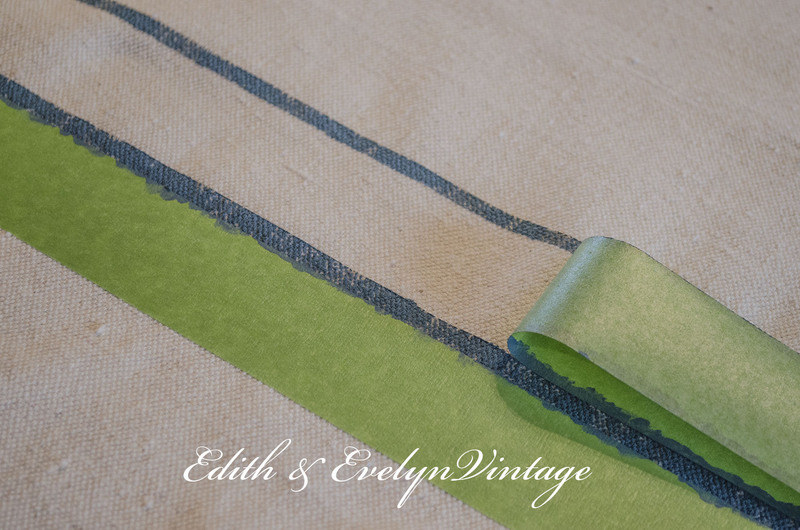 I have been looking for wide striped grain fabric with no luck..so I decided I am going to try to make my own. I do have one question…I will be making covers for some patio furniture..did you wash the fabric again after you painted on it? Did you use any kind of conditioner with the paint and/or fabric coating after painting? If so what did you use. Thank you…love love love your post. Read a few to see how to do this and this is the best yet! Hi Shelly! I didn’t wash the fabric after painting, nor did I use any kind of conditioner or additive. However if it’s going on outdoor furniture, I would probably spray it with Scotchguard or a similar protective spray. Thank you Susie! Good luck on your bench project!! Absolutely inspiring! I’ve pinned and drooled over your creation, now I’m going to buy some drop cloth and try it. Cannot say how much I love the faux grainsack tutorial and of course the finished project is over the moon wonderful! I was wondering when you made your homemade Boxwood wreaths , Did you spray paint them to stay green after they dry out!? Hope you are doing well, prayers of comfort . Thank you, Paula! I did spray paint some of them after they completely dried. Others, I just let them dry naturally and didn’t spray them at all. Eventually they have to be thrown out. I think you can also seal the stems with glycerin, which helps them to stay green, but I haven’t tried it yet. This looks so authentic! 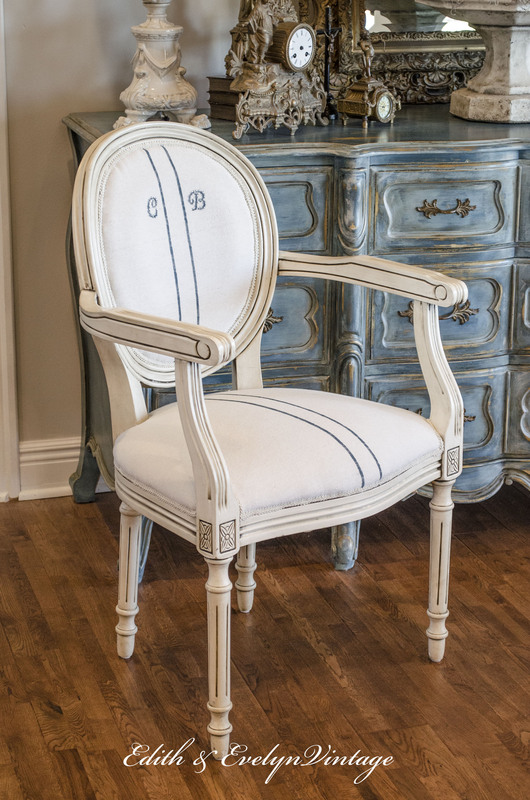 I used drop cloth and painted black grain sack stripe on my kitchen chairs but mine didn’t look as great as yours! 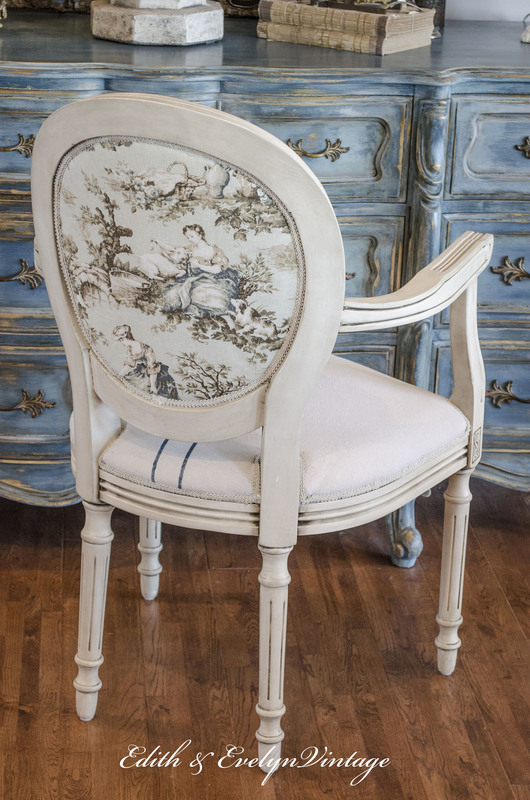 Love the toile fabric on the back of the chair. You have the magic touch and whatever you touch turns to gold. You are truly talented! Aw, thank you so much, Sandy! Wow Cindy, this idea is just fabulous! I really love the way it turned out….looks like the real thing…lol….woweeee who knew! 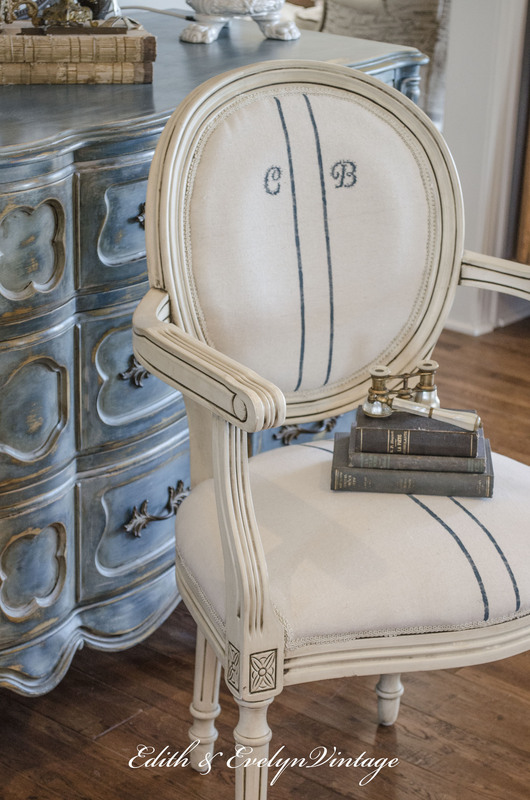 How darling is the back fabric on your chair…. Love everything about it….thanks for sharing your gorgeous creations…. New to this site, but will keep coming back, for sure! All I can say is G.E.N.I.U.S !!! Love, love, love! Was thinking… one could actually sew the cross stitch, as well; not hard to do… but the paint will probably hold up better than the floss with continued use. What do you think? I think the cross stitch would be lovely! It should hold up just fine, unless it’s on something that will be washed quite often. Such a beautiful project! 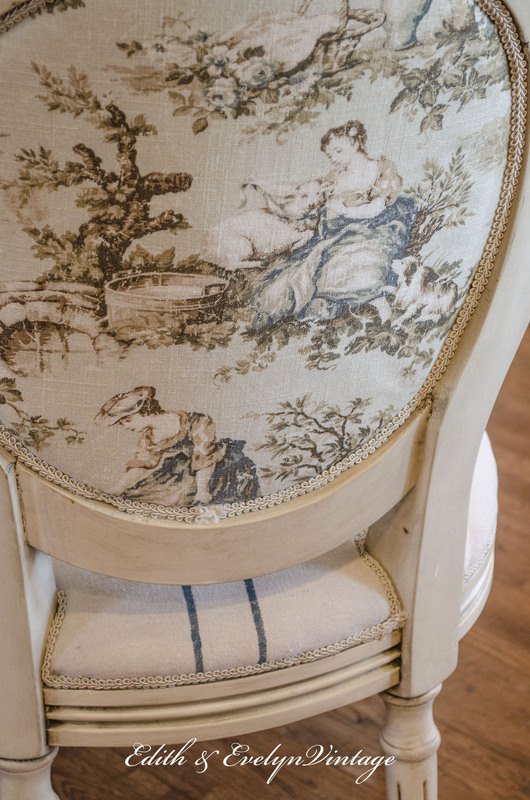 I especially love the fabric on the back of the chair because of the sheep. Will look for it at HL! Thank you for sharing your beautiful projects. Thanks for following along, Yvonne! Cindy, this is so beautiful! Enjoy all of your blog posts and all of the beautiful decor projects that you do! I love to see what all you do. I’ve haunted your site after searching for ways to deal with popcorn ceilings and finding you. That’s my someday project 😉 But in the meantime this dropcloth idea has my mind spinning with the possibilities. I am a quilter and never once thought of using that material but you can bet I will now. Thank you for all the good information and ideas that you provide. Hope you have a wonderful and safe holiday. I’m so glad this has inspired some ideas, Darlene! Happy Independence Day! Where did you purchase the canvas drop cloths? The one that I used for this project is from Home Depot! That’s wonderful, Diane! Thank you! Lovely chair redo, Cindy!! Looks great! I like how you added the small x’s to imitate stitch marks – I will have to try that next time. I re-did a small stool with dropcloth to substitute grainsack. Added a red line and an iron-on transfer from the Graphics Fairy and I love how it turned out. Cost was very little. I wish I could send you a picture to see it! Another beautiful project Cindy! 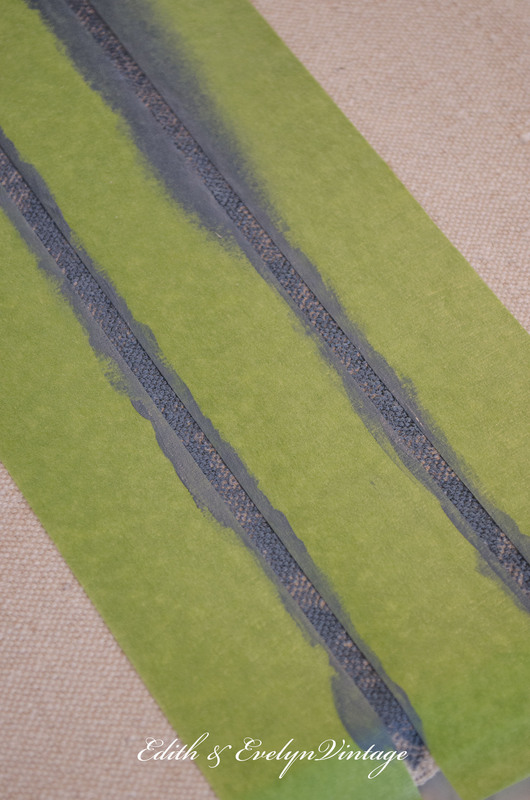 I’ve done this stripe before and I sand it afterward to get the worn look you got by your method of not using full paint coverage. 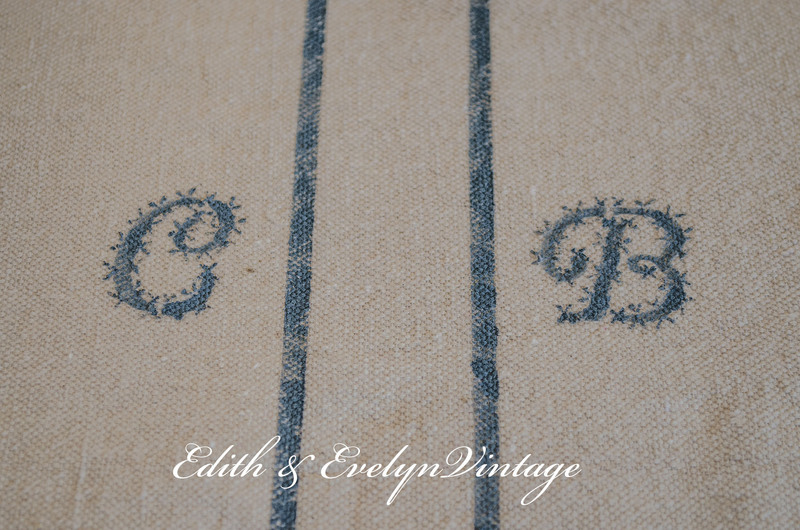 But the icing on the cake is the initials with the faux stitch marks!! You are so creative, and I love your style. Thank you, Amy! I love simple and easy! I hope you are enjoying your new babies (four legged and two legged)!! Thanks so much for the tutorial Cindy! So love the way it all turned out and I so love that this was a totally a “no-sew” project! Love how you created the “x’s” to give it a real authentic look! Beautiful job as always! Have a very happy and safe 4th! Thank you, Shirley! I love “no sew” projects! My sewing machine hates me! Just Love everything you do and I so look forward to your post! Can’t wait to try this. 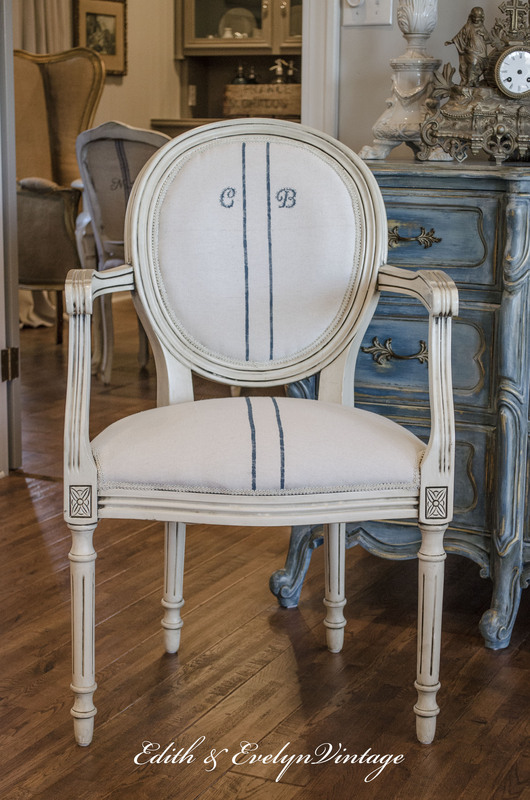 Would like to do slipcovers for my pair of wing chairs with this method. We are selling our beautiful brick ranch and moving to a manufactured home in the mountains. Hope to use many of your ideas to transform the house. Will be painting the kitchen cabinets as they are an ugly oak. Your post on the transformation was the inspiration. It is my hope that I can transform this place. Thank you for all your fabulous ideas. Thank you so much, Kathleen! Good luck on your exciting move!